If you worked in Canada and the USA and paid into government pension schemes (Canada Pension Plan, Quebec PP, and US Social Security), you should know that these governments coordinate their retirement pensions for your benefit. There is a treaty that governs this coordination and how you are taxed on the payments. Each country gives you credit for your years or quarters of work when looking at pension entitlement. This means that you could get a partial US social security pension, even if you worked less than the 40 quarters required for Social Security. You could get pension payments from both governments, say your CPP and a US social security pension. You could get Canadian Old Age Security (OAS) on top of your CPP. This is especially advantageous if you live in the USA as the treaty does not allow the Canadian government to claw back OAS if you live in the USA. If you live in the USA, your CPP and OAS will not be taxed by Canada and may get the same advantageous tax treatment as US social security. On the downside, your Canadian work experience does not count towards US Medicare once you turn 65. If you and your spouse do not meet the strict rules for government-paid Medicare, you will have to purchase it from the government or find other medical insurance. Another downside is that you have to deal with varying exchange rates, the governments are not going to make you whole if one currency or the other gets devalued. The US process will be long and the civil servants will not be sure how to help you. It may take over a year for them to figure out how much to pay you. Remember, in the US, we do not like to fund our government services with taxes and it shows in the service you get. The Canadian process will be quick and the civil servants will be well trained on how to handle your claim. You can even get direct deposit to a US bank. Recall that Canadians pay heavy taxes and government services are a priority to Canadians. I hope this helps you get all the benefits that you earned over your lifetime. What is the Best Portfolio Allocation Immediately Prior to Retirement? What should you allocate to stocks and bonds just prior to retirement, say, in the last 2 to 3 years of work? This is a question that all of us without lucrative defined benefit pensions will have to confront at some point. Use a standard allocation based on your risk tolerance, age, and other factors, i.e. don't do anything special. Reduce the risk in your allocation by holding more cash and/or short term bonds. Point 1. is the current wisdom "stay the course" as I discussed in earlier postings. Point 2. is interesting and it is based on the notion that the most critical time for your retirement in terms of finances are the first 1-3 years before and after retirement. If the stock or bond market goes down significantly, your early withdrawals will deplete your nest egg too quickly too early and you will outlive your money. This Marketwatch article and the papers it references give a good explanation, but the figure below taken from the Thornburg webpage illustrates it best. In the positive blue scenario, our lucky retiree has a 60/40 stock/bond portfolio and retires in 1989, takes out 5% in the first year and increase withdrawals by inflation, and 21 years later, the $1M nest egg has grown to $2.6M. In the unhappy green scenario, our unlucky retiree also has a $1M nest egg split 60/40 but retires in 2008 and makes the same 5% withdrawal, but the nest egg falls to $0.8M - only 30% of the riches of our lucky retiree. This is a rather drastic scenario as it has a high withdrawal rate (5%), and the unlucky retiree retires at the start of the "Great Recession". But it does illustrate the concept. You can think of these two scenarios as the "best case" and "worst case" of the 5000 scenarios run by the Vanguard Monte Carlo tool referenced in my blog previously. There is no consensus in the industry today whether to change your allocation just prior to and after retirement, but it is something to think about and maybe discuss with your financial advisor. My solution was to accumulate about 1.5 years of expenses in a super-low-risk bank savings account just prior to my career shift/retirement. Had one of those moments yesterday when you know you are getting old. My wife and I are traveling with luggage and are catching the bus from the rental car complex to Phoenix airport. I schlep the luggage onto the bus with the bus driver and there is one seat left up front for my wife. She sits down and the young gentleman next to her offers his seat to me and will not take no for an answer. With resignation I sit down and think "am I that old?". 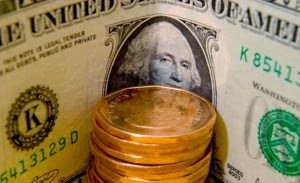 It is ironic that in the USA today, you get paid more to spend a dollar, than to save a dollar. I believe it is the same in Canada. If you save a dollar, the best online savings account will pay you 0.85% to 1.0% per year in interest. Bond funds might pay you 2-4%, but you may lose money if interest rates go up. On the other hand, with the right choice of credit cards, you get at least 1.5% back on all purchases and up to 5% on categories like gas or restaurant purchases. This is paid to you within a month or at worst within a year, depending on the card. You can also get miles, discounts, or dollars just for opening a new credit card account. Is it any wonder that household debt is rising in the US and Canada again? I reached the halfway point on my Canadian CFP course on Retirement Planning. It is still interesting to see the "Goldilocks" Canadian retirement system. Also, I had the opportunity to test the government services of the US and Canada on social security and Canada Pension Plan by phoning both governments for information. US - long waits on the phone, reasonably knowledgeable person provided some information, but no detailed knowledge of how CPP and US SS are coordinated, did not sound like a happy camper. Canada - no waits, super knowledgeable person, happy camper. So while CPP is less lucrative than US Social Security, Canadian government workers seem happier and more knowledgeable. We just received 2 feet (60 cm for Canucks) of snow here in Northern Virginia, which is pretty unusual, and the schools, businesses, and governments are shut down. 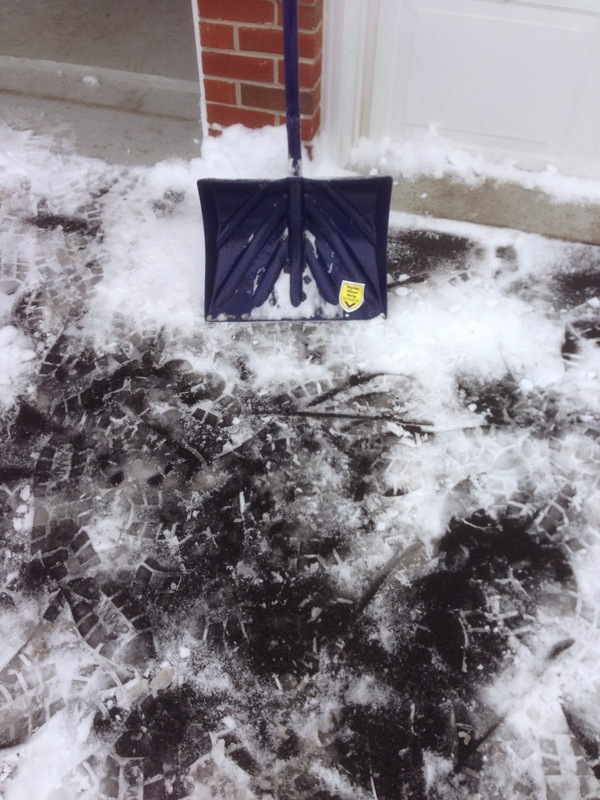 I thought it would be best to share my snow shovelling tips as a 56 year old based on living in Canada and here in NoVa. 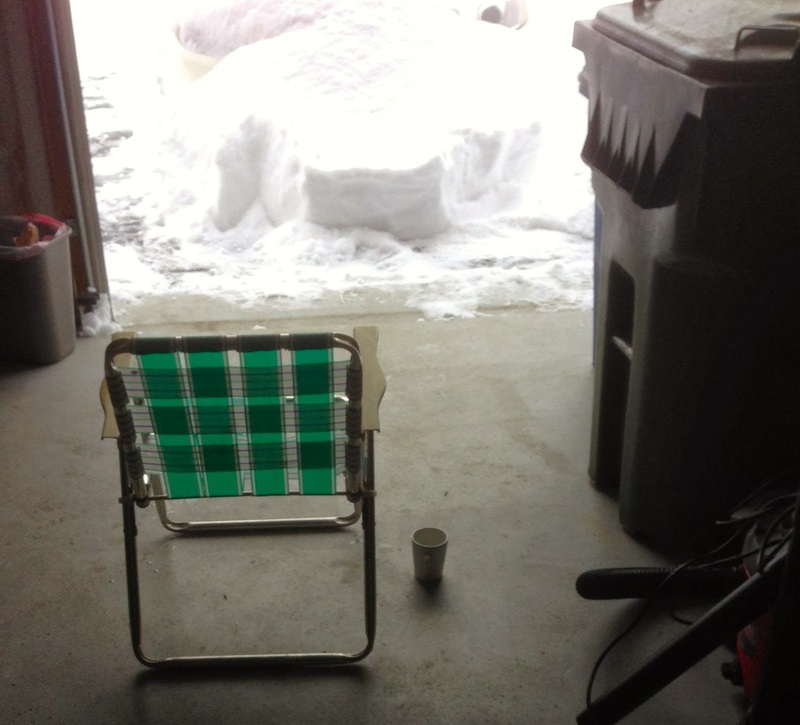 Set up a lawn chair in the garage so you can take frequent breaks and admire your work. Bug the wife to bring coffee frequently. Note Tim Hortons cup. The Elbonian Heart Society recommends that the width of your shovel should be calculated as follows: (90 - age) * 0.70 = width of Shovel. At 18, you have a big one, at 90, you don't have one at all. 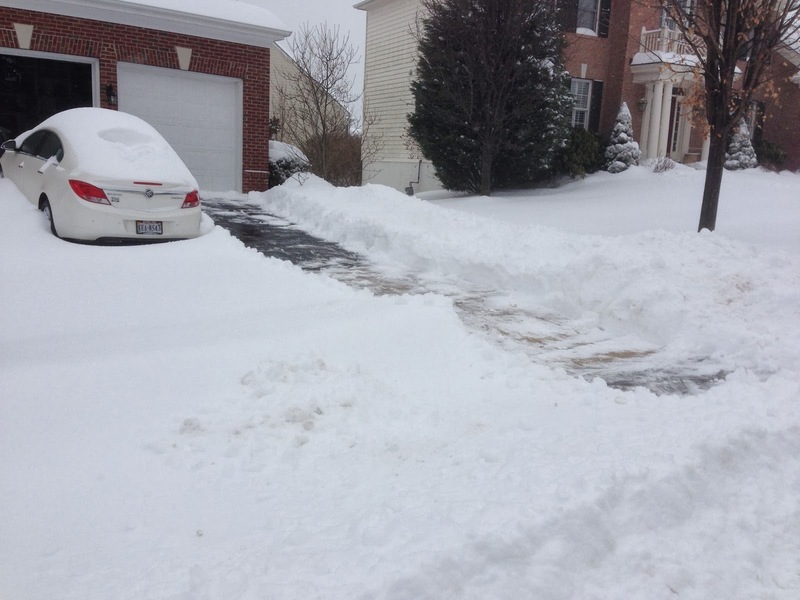 At 56, you have a 24 inch shovel, use it wisely. 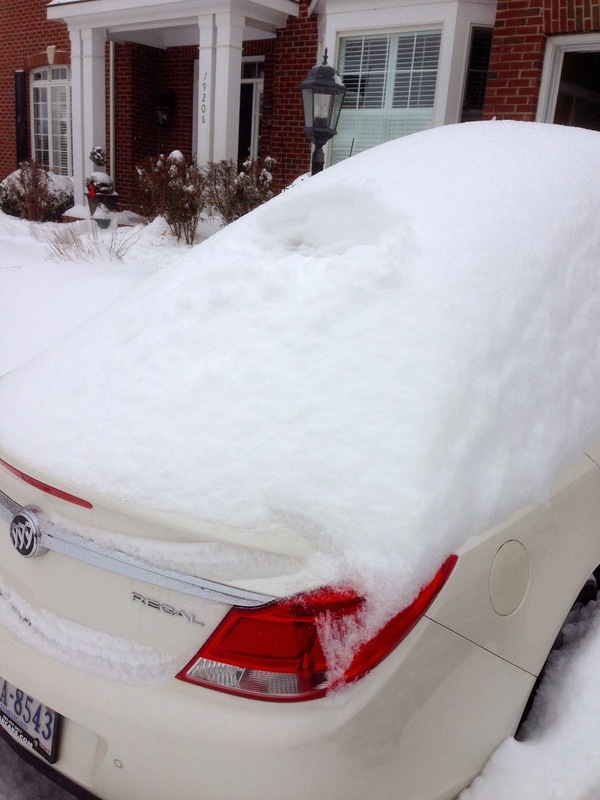 Leave a car outside to keep snow off the driveway. When possible, make a tiny hole at the rear window and reverse quickly into the street, then brush all the snow onto the street. It is advisable to check for people in the street before attempting this maneuver and a hearty shout of "WATCH OUT!!" is also helpful. Leave a 2 foot unshoveled area near the road until the earlier of (1) you need to get out or (2) the plow dude has stopped plowing. This will stop the caffeinated meth-crazed plow dude from dumping more hard snow and ice in your newly shovelled driveway. 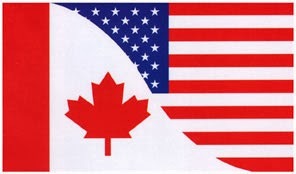 Can a Dual Citizen Living in Canada Keep a US IRA? After listening to the horror stories from the Cross Border Financial Planners, I decided to check with Vanguard USA and Fidelity to see what happens if we become resident in Canada but we still have IRAs in the USA. The anecdotes from the planners have IRA accounts being closed out without notice, extra tax withheld, high tax bills for the US person who moves to Canada, and so on. Fidelity writes: no problems, you can still hold your IRAs with us and make changes to them as needed. You have to close your regular accounts, which I already anticipated. Vanguard says: not much, kind of a strange answer: "Our policies are going to lookvery similar to the other firms that you are speaking of." This could be yes to IRAs or could be no, and I am waiting for the ice storm in the South to pass and my representative to get back to the office to find out. Note that the dreaded ice storm has not yet hit Boston, the home of Fidelity. Anyway, I can always transfer all the IRAs to Fidelity to solve the problem. But I better get out and buy some candles, duct tape, water, rice and milk for the dreaded ice storm that is mentioned on the TV every 10 minutes or so. The old rule of thumb was that you would spend 30% less in retirement than when working (1). This was called the "70% Rule". Lately, financial planners started to doubt this rule. What are our experiences so far? More time to eat out with spouse. No drop in lunch expense as I used to brown bag to work. Fixed implies the expense cannot be easily changed month to month. So the reduction in expenses is pretty small, single digit percentage points depending on your starting point. The biggest change is driven by fixed auto expenses. Your experience may vary. I am planning on no change in our expenses in retirement, particularly for the first 10-15 years. (1) Setting a new retirement income target, Financial Post, July 23, 2013.